It’s that time of year again… all pumpkin everything. I’m not complaining. While I might take a pass on those pumpkin lattes, you’ll definitely find me snacking on pumpkin seeds, eating this divine pumpkin beer sharp cheddar gnocchi soup, and slathering my skin in this amazing pumpkin based face mask all season long. Pumpkins are amazing, y’all. Every year I try to incorporate at least one seasonal beauty recipe into my routine. This year, I’m totally crushing on Pumpkin Seed Oil. 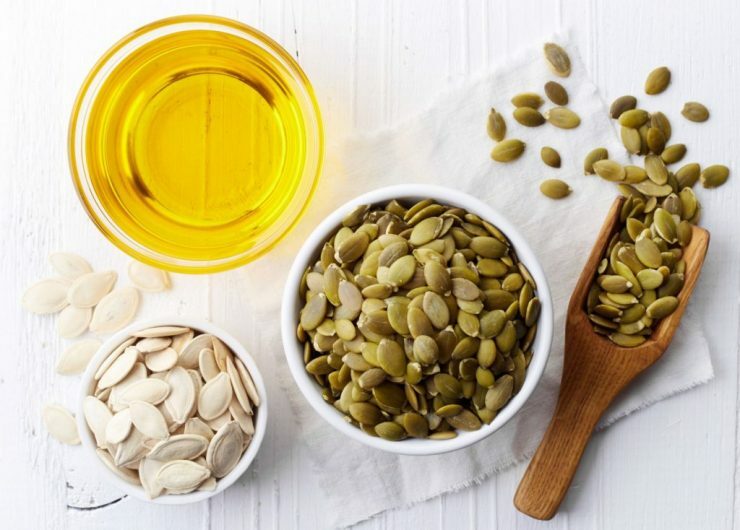 Pumpkin Seed Oil is rich in vitamin E, zinc, omega 3- and 6- fatty acids, and antioxidants. The high amounts of zinc and vitamin E improve skin tone, help wounds heal more rapidly, fight acne and help with skin renewal. Even better, many of the minerals and vitamins in Pumpkin Seed Oil have anti-aging effects as well. This versatile carrier oil is the perfect addition to your fall beauty routine. Use it as a cleanser. Use it as a toner. This stuff does it all! Check out these Pumpkin Seed Oil beauty recipes that are sure to become your Fall beauty routine faves! Mix ingredients together and apply to damp skin. Massage your face and neck in a circular motion and rinse off with warm water. This is an easy one. If you love witch hazel and you often use it as a toner then you know that it can quickly dry out your skin as the weather gets colder. Pumpkin Seed Oil will be your new best friend. Simply add equal parts Pumpkin Seed Oil and witch hazel to keep your skin both toned and moisturized. You may need to play with the proportions a bit to suit your specific skin care needs.